"Modern astrology is based on what is usually called the horoscope or birth chart... But there is also a kind of astrology which does not use horoscope chart. 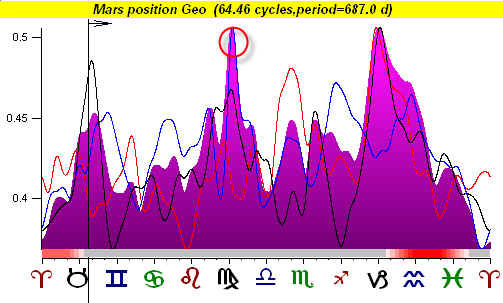 Here the planets are used as indicators of cycles. For example, we have the 20 year cycle of Jupiter and Saturn. We except to find cyclical patterns of twenty years duration in terrestrial phenomena and these phenomena reliably and continuously correlate with the movements of Jupiter and Saturn. Business and economic cycles fall into this category". We first faced with this problem in 1998, when the first astrological Neural Net had been developed. The task was classical: to get a forecast for future price movement taking into consideration the aspects to the Natal chart. Immediately the question has been raised: what Natal chart is correct? In 1998, I had not doubt regarding Natal charts - we used charts found and checked by such a professional in this field as Bill Meridian. However, while making a research, we always have a nasty feeling "what if our Natal chart is not correct? It means that all our calculations are wrong". A mistake of 10 minutes for the Natal chart can cause a significant discrepancy between the forecast and reality. The solution has been found very unexpectedly. Instead of analyzing the aspects of transiting planets to the Natal chart, we can analyze EACH degree of Zodiac. Thus, we move the accent from Natal chart to sensitive points. This diagram shows how the Volatility for Dow Jones Index changes in respect to Mars's position in different parts of Zodiac. 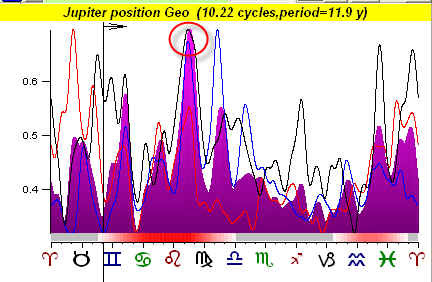 The peak in the beginning of Virgo indicates high volatility when Mars is in the beginning of Virgo (geocentric system). It means that there is a lot of activity on the stock market when Mars passes this sensitive point. We can assume that the beginning of Virgo is some sensitive point for DJI. 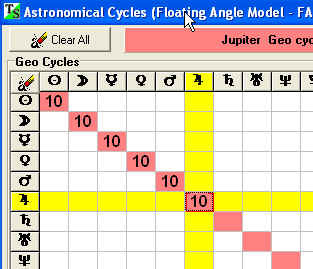 It is quite possible that some object of DJI's Natal chart is located in this point. The main idea of this approach is we do not care what Natal chart is applied for the analyzed financial instrument, we simply reveal its sensitive points, and the Composite module does this job very well. Some other sensitive/Natal point is responsible for this fact (not the same one as in the previous example). 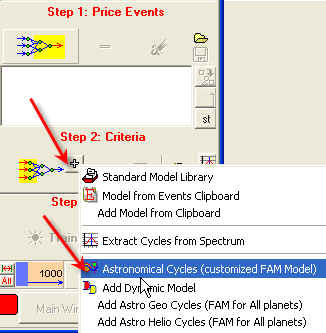 The advantage of this approach is that we do not need to know the exact time of the Natal chart, the program itself finds the sensitive points and creates the forecast models. The most important fact is that these models definitely provide the better forecasting models. TS Neural Network will run a very sophisticated procedure called suboptimization. This procedure reveals the sensitive points very accurately. Moreover, it find the best orbs for all sensitive points. This approach seems to be more effective as it eliminates human preferences regarding true natal data, choice of the chart type (corporation versus registration etc.) and the orbs.